As usual, these findings are spun into an evolutionary tale for the public. These spindle structures are found in the same place in the brains of both primates (apes and humans) and larger whales (humpback and fin whales). So at first sight they appear to be homologous, which means that they evolved in the supposed common ancestor of primates and whales. However, this neither fits the evolutionary story nor what is found in biology. Firstly, the evolutionary story says that the common ancestor of primates and whales lived about 50–60 million years ago (mya).1 However, these spindle structures are not supposed to have evolved in whales until about 22–30 mya and in primates until about 15 mya.1,2 Secondly, not all primates and whales have these types of cells. Plus there are many other animal groups, neither primates nor whales, which are supposedly descended from such a common ancestor, which do not have such cells. There therefore must have been considerable selective loss in the descendants of the ‘common ancestor’ of all these animals with and without these structures. Because all other evolutionary explanations fail, then no matter how improbable it would seem to have the same highly complex structure evolving independently by chance mutations/selection, such a claim must be invoked to salvage evolution. In short, evolutionists can’t say these spindle structures are homologous. So they are forced to invoke homoplasy (in the form of ‘parallel evolution’) to explain how these ‘spindle’ neurons evolved in both primates and whales.1,2 This means that spindle neurons had to independently evolve twice, once in whales and once in primates. These sorts of explanations are a last-ditch effort to explain the patterns we observe while still holding on to the idea of evolution. Because all other evolutionary explanations fail, then no matter how improbable it would seem to have the same highly complex structure evolving independently by chance mutations/selection, such a claim must be invoked to salvage evolution. On the other hand, it’s very easy to see how these sorts of structures fit into the Bible. God created these similar structures, for similar tasks, in creatures that are not at all related. For example, John Allman, a neurobiologist at the California Institute of Technology in Pasadena, says the neurons probably ‘support fast communication … in very large brains.’1 Using similar structures in different animals is something that in Bible times would bring great honour to God as a master engineer.5 So God is glorified by homoplasy. 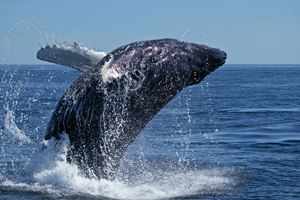 Well-wired whales, Science 304(5804):1363, 2006. Return to text. Hof, P.R. and Van Der Gucht, E., Structure of the cerebral cortex of the humpback whale, Megaptera novaeangliae (Cetacea, Mysticeti, Balaenopteridae), The Anatomical Record Part A: Discoveries in Molecular, Cellular, and Evolutionary Biology DOI: 10.1002/ar.a.20407, published online 27 November 2006. Return to text. Hanlon, M., Can an animal fall in love? Daily Mail, 11 December 2006. Return to text. ReMine, W., Evidence for message theory: a review of Life’s Solution: Inevitable Humans in a Lonely Universe by Simon Conway Morris, Journal of Creation 20(2):29–35, 2006. Return to text. Holding, J.P., ‘Not to be used again’: homologous structures and the presumption of originality as a critical value, 29 November 2006. Return to text.